I didn’t really understand the true value of friendship until I got into my thirties. I was an only child and for various reasons always felt like an outsider when I was at school. The friends I made there were similarly not part of the in-crowd. For mysterious reasons that ultimately served me well as a writer I was always drawn to the offbeat, the dispossessed, the possibly slightly unhinged, the ones that looked as though society shunned or misunderstood them. My mother despaired when, having been sent to a private school at age four, my best friend of choice was Sally Sullivan, the girl whose cardigans never had any buttons on and whose hair looked like a bird’s nest in a hurricane. What her story was, I have no idea, but I do remember admiring her wild and devil-may-care attitude. There have been many Sally Sullivans in my life in the years since. At secondary school I was, if anything, part of the out-crowd, if there is such a thing. It was a small select group. In fact, I don’t think the word ‘group’ could realistically be applied. I wasn’t unpopular, and I wasn’t bullied, but I was a bit too clever for my own good. I wanted to talk about philosophy, preferably in French. Well, that was just a passing phase, of course, and unbearably pretentious. But you get the picture. I used to ask witty questions of the teachers, which raised a laugh but didn’t endear me to anyone. I was never teacher’s pet. More like teacher’s thorn in the side. When I left school at seventeen, flying in the face of all the hopes, dreams and intentions of my parents and my teachers, my headmistress said: “I wonder what will become of you?” I lost touch with my chums from school and moved into what seemed much more colourfully to be The Real World.The stuff of which my autobiography, if and when I get around to it, will be filled. But for now, let’s skip quite a few years during which an awful lot happened but none of it particularly relevant to the theme of friendship. I suddenly discovered what I now think of as real friendship in my early to mid-thirties, as my second marriage began crashing melodramatically into a heap of predictable rubble. Plenty of grist for the writer’s mill there, for which I have been glad. It’s always good to observe the silver lining and make the most of it. Prior to that friends had been ‘our friends’ or increasingly ‘those weird dungaree-wearing women with butch haircuts that you hang out with’ (his definition, never mine.) I discovered how supportive women could be of one another, how brave, how bawdy, how honest. I found how important it was to share feelings, however shameful and irrational they seemed, (especially the murderous ones,) and how good my women friends were at listening without judgement or without doing that very manly thing of ‘fixing’ the problem that you already know is tragically unfixable. For the first time since the days of Sally Sullivan I risked getting closer to other women. Having never had sisters I really didn’t know the rules. These new friendships were not social ones, where we went out and partied (I’d had a number of those) but deeply intimate exchanges of our thoughts and desires and sorrows. We understood one another’s disappointments and weren’t afraid to laugh at ourselves. Women are particularly good at that. By the time I had swept the last of the marriage rubble into a corner of my mind I rarely noticed any more, I had embarked on a very different chapter of my life. As I entered my forties I really got the hang of friendship. By the time I’d completed my psychotherapy training my inner world had been transformed, and my outer life reflected that. I didn’t give up being witty entirely (wordsmiths mostly just can’t help themselves) but I valued increasingly the importance of kindness over cleverness. The friendships I made during this period of my life proved to be enduring and supportive and life-changing in ways I never could have imagined. I guess that’s the nature of experiences that change your life. Most of the friends that I made then were also psychotherapists, or therapists of other kinds. People intent on healing – which meant they were inevitably wounded themselves. The obvious fact is that we are all wounded. It’s what you choose to do with the wound that makes the difference: flaunt it, wear it like a badge of identity, make it worse, blame the world for it, seek revenge for it, invite more of it, deny it, cover it with layers of disguise… there are plenty of ways to not do anything to heal it. But then, if you face up to the fact that the wound is there, and begin to understand how it happened, you are one step towards the process that ultimately heals. The people who came into my life as friends in my forties and fifties have all been on that pilgrimage towards healing, one way or another. We speak the same language, have the same priorities, struggle with many of the same issues, and breathe in the same life-giving air of truth. The best friends I’ve known, and still know, are the ones who never duck from careful self-examination, and recognize that blame is futile. When you stumble into the potential minefield of disagreement it’s a waste of energy to point the finger either towards the other person or yourself. However much we all love to be right (and don’t we just!) friendship thrives on the willingness to make that less of a priority than understanding one another. To be understood is one of the greatest blessings, and to offer that understanding to another person is such a gift. As you get older your perspective shifts so radically. It really isn’t something you can comprehend in your youth, the way that the equation shrinks in terms of percentage of life expectancy yet to come. You start making statements like: “Life’s too short…” about an increasing number of things. Life’s too short to spend time doing this or that… where will it end, I sometimes wonder? Will I eventually think life is too short to get up in the morning? I suppose it could happen. You do begin to value the things you have, the more you see slipping away. And friendship is top of that list. It gets harder to make new friends as you get older, even in this age of facebook and twitter where ‘friends’ and ‘followers’ take on a whole new meaning for those of us not born into this age of instant and often unstable hellos and goodbyes. Sadly, the older you get, the more likely it is that some friends will leave before you, and partners are more likely to be lost through death than divorce. Which gives “Life’s too short…” a completely other spin. Life is too short not to enjoy every moment of connection you can, to imbue it with meaning and authenticity, even if it’s a tweet or a facebook post. I’ve had a number of relationships in my life (in case you were thinking it all ended with the rubble of my second marriage… oh no, dear reader, that was but the start of a whole new set of adventures…) and some have not been possible to sustain beyond the breakup drama. Sometimes the kindest thing is to exit stage left from someone’s life, or to wish them well on their onward journey. But in a few cases a deepening friendship has been the outcome, and for that I’ve been grateful. In my own experience, true friendship has been what has nourished me, enlivened me, healed me, and inspired me. When I think of my friends, as I am doing now, I feel humbled with gratitude for all that they’ve meant, over the years, and all that they’ve given me, freely and without expectation of any return. These days I include four lovely men among my dearest friends. I think of them as brothers, although none of them know each other and they each come from very different backgrounds. And my much loved women friends – you know who you are. Some have been in my life for longer than others. All are beautiful, strong, courageous women who aren’t afraid to speak their minds. 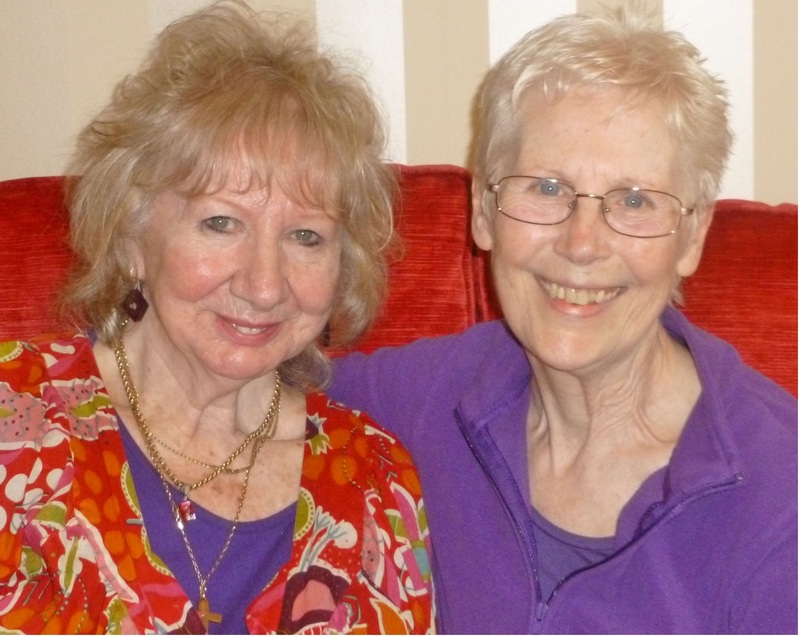 The picture at the top of this post is of me with my friend Sheelagh. We met twenty-five years ago, and have been alongside each other ever since through so many changes in both our lives. She is the closest I will ever have to a sister, and our experiences and challenges have so often run on parallel tracks. There is such a profound sense of being held in a friendship where you know and accept each other not just for the positive stuff but for the shadow that lurks beneath. Friends forgive. They don’t judge, although they give you sound advice when they think you need it, even if it’s something they suspect you won’t want to hear. They do it in such a way that you know they love you anyway. Tears come to their eyes when they feel your pain, and they don’t hold back from sharing their own, so that the friendship always feels grounded in equality. They feel joy at your successes, and do everything they can to help you make them happen. And when life’s inevitable disappointments come, they give words of comfort that come straight from the heart. On days when you feel that nothing is possible, after half an hour with them they can make you feel that anything is possible. They aren’t combative or competitive – except perhaps at Scrabble or Uno. And they really enjoy sharing a good moan or a rant about what’s wrong with the world. Plenty to choose from there. It’s a conversation that can run and run. So, anyway, today these are my random thoughts about friendship. As I said in a previous post, I have been told I have a friendly face. But there’s a lot more to being a friend than that.